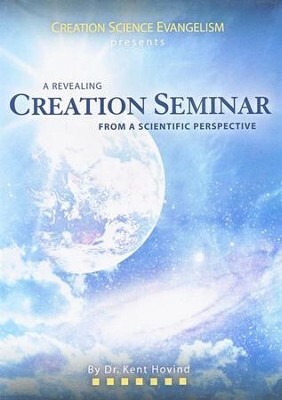 Immerse yourself in learning about creation science with this 7-DVD Creation seminar from creation authority Dr. Kent Hovind. Uncover the Big Bang theory; trace the biblical and historic references to the co-existence of dinosaurs and people; learn about the dangers of evolution and even sit in on a question-and-answer seminar! You'll find your eyes wide open after 17 hours of listening to Kent Hovind's blend of science and Scripture. Seven DVDs in plastic case. Includes CD-Rom with Seminar Notebook & Workbook, Longevity Chart and Timeline Chart. I'm the author/artist and I want to review Creation Seminar (Seven DVD Boxed Set).